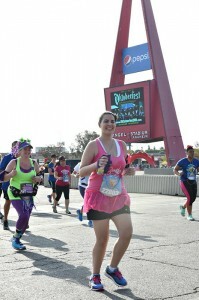 As a runDisney addict, I love getting as many pictures as I can during the races. 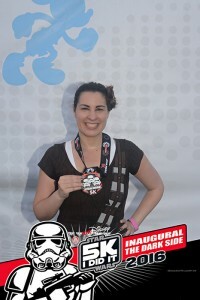 Starting with the Star Wars Dark Side race weekend at Walt Disney World, Disney PhotoPass became the official photo provider for runDisney, instead of MarathonFoto. 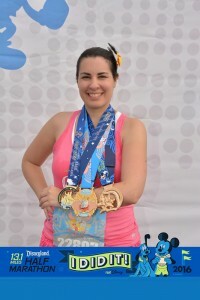 I have now participated in two runDisney race weekends since the change, one at Walt Disney World and one at Disneyland. Here’s a rundown on how Disney PhotoPass works with the races. In the official race guide and on the back of your bib is a code for each race, where you add your bib number to the end. Then, you enter this into the My Disney Experience App, the Disneyland app, or MyDisneyPhotoPass.com. 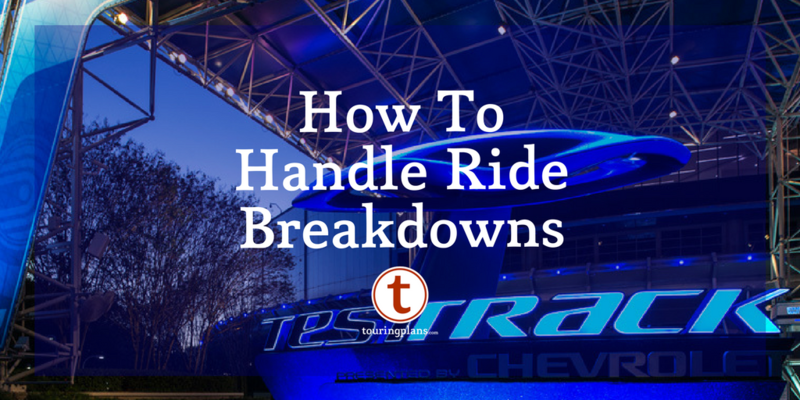 The code is usually the year, race weekend abbreviation, race distance, and your bib number. For example, the code for the Star Wars Dark Side Half was 2016-DARK-HLFx-xxxx, where the x is your bib number. You have a separate code for each race, even if you are doing a challenge during the weekend. The best part of this change is that if you have an Annual Pass that includes Disney PhotoPass pictures, or have purchased Memory Maker at Walt Disney World or Disney PhotoPass at Disneyland, then your runDisney pictures are included as well! With MarathonFoto, you had to pay separately for each race (with a small discount if you were doing a multiple race challenge), as well as for each person. So if you ran with family or friends, and weren’t always together during the race, you had to pay separately each time if you wanted all those pictures. Now, you can enter everyone’s code under one account. 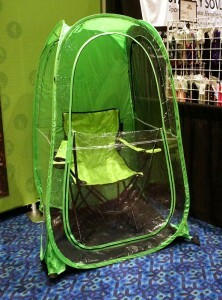 This is a huge cost savings. For example, the Princess Half Marathon race weekend was the last before the change. I did all 3 races, and my mom did the 5k. I ordered the Glass Slipper challenge package, and paid $104.95. I didn’t order my 5k pictures (only because of the cost), but I also ordered my mom’s 5k pictures from the race weekend, for another $74.95. 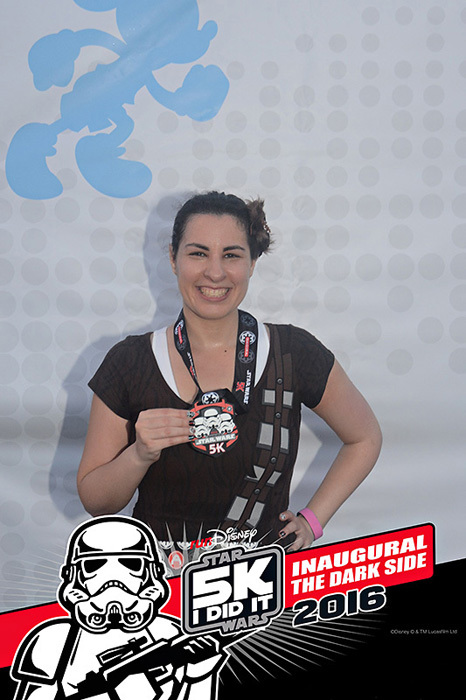 During the Star Wars Dark Side race weekend, my mom and I did the same number of races as at Princess, but since we are Annual Passholders, we received our pictures from all 4 races we did, and didn’t have to pay an extra $180. Another great benefit is that the race pictures are now easily downloaded from the My Disney Experience app or Disneyland app to your phone, so you can share with friends and family, or on social media. Pictures start showing up later the same afternoon, and most should be there by the next day. Who doesn’t like being able to share pictures so quickly? During the race, you couldn’t miss the Disney PhotoPass photographers. 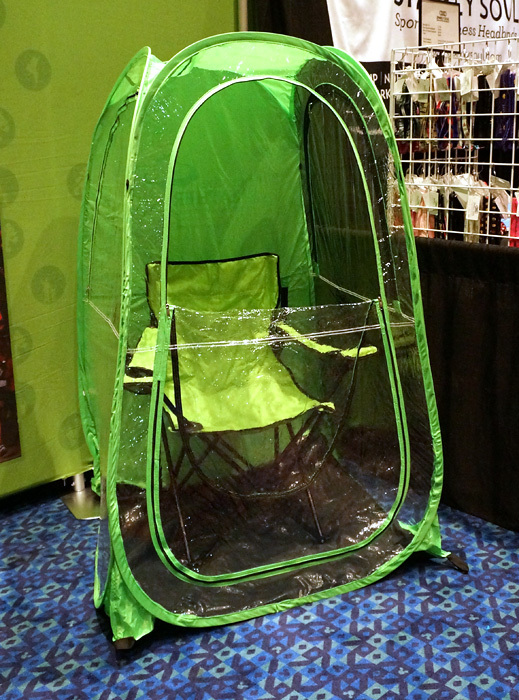 They were in, or right outside, a green tent. During the Star Wars Dark Side race weekend, they also had a green balloon on the tent. There was also tape on the ground, and when you saw that, you knew you were in their sight line. Neither the balloon nor tape was used during the Disneyland Half races, so I don’t know if that will only be used for the Walt Disney World races, or if it was something they tried just for that first race weekend while they were learning, but won’t be using in the future. The most important thing about pictures is that they look good. No one wants blurry or poorly exposed pictures, even if they are free. 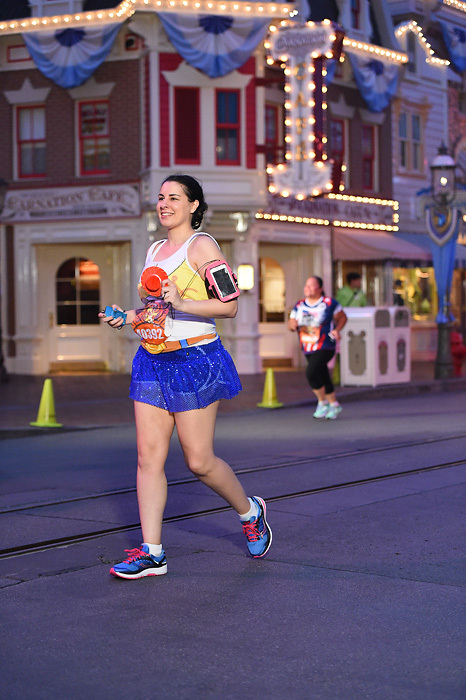 In general, I feel that the Disney PhotoPass pictures are better than the previous MarathonFoto pictures. Since a lot of the race inside the park takes place before the sun comes up, I was happy to see huge lights set up around the park where the photographers were. This also helped with the quality of pictures. I still have a few out of focus pictures, but overall, most of the pictures were better quality than the ones taken in the past. Running down Main Street, U.S.A. runDisney Disneyland 5k. Thanks to the new Disney PhotoPass lighting while it’s dark out! It also felt like there were more photographers along the course, especially in the parks, than with MarathonFoto. 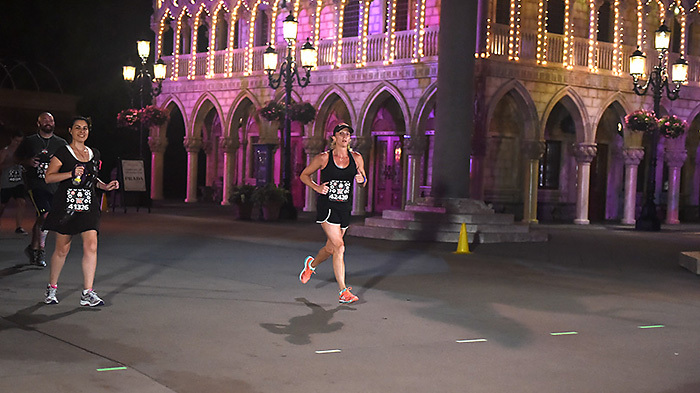 During the Star Wars Dark Side 5k, there were several Disney PhotoPass in a row set up after Spaceship Earth, to get action shots of you running under it, which was cool. At the Disneyland races, there were photographers standing in the middle of Main Street, which I never saw before. The more photographers that are out there, the better chance you have of getting at least one good running picture! 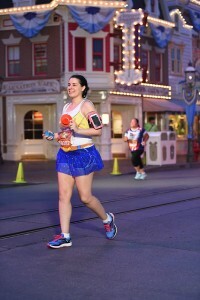 Even with all the positives, there are a few things I miss about MarathonFoto that I would like to see Disney PhotoPass reinstate. The biggest negative for me is that you can no longer search for unidentified pictures, like you could with MarathonFoto. It was very tedious to look through thousands of pictures, but I always found several pictures that were not associated with my account. Now, there isn’t any way to look for missing pictures. If there are pictures you know are missing, you can contact Disney PhotoPass, and they will look and hopefully be able to find the picture and add it to your account. But some pictures I’ve found in the unidentified section over the years, I didn’t even realize I had taken. 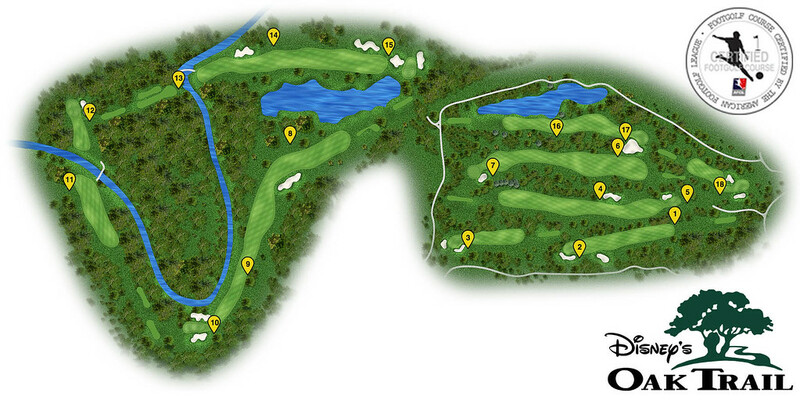 Other than character or park icon spots, it’s impossible to remember where every photographer is along the course that you ran by. 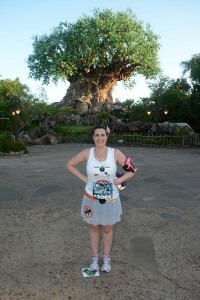 My first half marathon was the 2014 Wine and Dine Half, and I didn’t remember getting any action pictures in Disney’s Animal Kingdom. But when I searched the unidentified pictures, I found two. I am happy to have any pictures from that race, since it was in the pouring rain, so there weren’t many photographers out. With the new system, I would have been out of luck. Since the Star Wars Dark Side weekend was the first race weekend for Disney PhotoPass at the races, there were a lot of issues. Hopefully those kinks have been worked out, since I didn’t see most of them during the Disneyland races. But with that race weekend, none of my half marathon pictures showed up, and it took weeks of back and forth with Disney PhotoPass to find them. There are some from the 10k and half marathon that were never found. 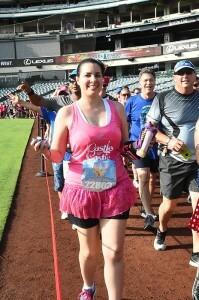 With the Disneyland races, it’s 3 weeks after the race weekend, and I’m still missing at least one picture. It’s always hard losing pictures with Disney PhotoPass, but it feels even worse when it happens during a race. After the race, the medal picture setup is different than it was with MarathonFoto. On the bright side, there are more photo lines than in the past, so the lines weren’t that long. However, each race used to have their own themed backdrop, and now the backdrops are all runDisney generic. I’m sure this is another reason that the photo lines aren’t as long, because people don’t think it’s necessary to stop for a picture now. They do add a digital border to your picture for that race, but then your bib or costume may be covered and it’s harder to edit the picture for color or brightness. With 6 races I’ve done since the change, I’ve had issues with the border on half of them, and have had to contact them. One they put the 10k border on a 5k picture. Another they didn’t put a border on at all. When you do a challenge, they have different lines for the race and the challenge, so you will can also get a border for the challenge. I did this for the Dumbo Dare challenge at Disneyland, and that border hasn’t shown up yet. I’m sure this is a cost cutting move, since they would have to print up new backdrops every race, but it’s still something that I wish they would bring back. I also noticed that finish line pictures are mostly closeup pictures of crossing the finish line now. MarathonFoto also had pictures to show the whole finish line area, and everyone crossing, along with the pictures of just you. During most half marathons, they even had video of the finish line. There also always used to be photographers out before the race, in the starting area and on the way to the corrals. It was nice to be able to get a picture of my race costume, before I got sweaty from running. Also, after receiving your medal, there were photographers that would take your picture walking through the finish chute area. Disney PhotoPass didn’t have photographers doing either of these, so it’s less pictures that you’ll receive. Here are a few more pictures from Disney PhotoPass from the Disneyland Half Weekend. 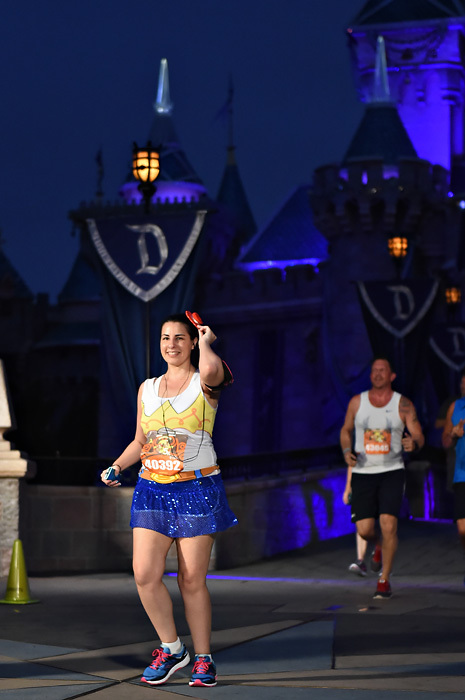 Are you running a future runDisney race and are excited about Disney PhotoPass photographing the race? Let me know if you have any other questions about Disney PhotoPass and runDisney! Good info, thanks! 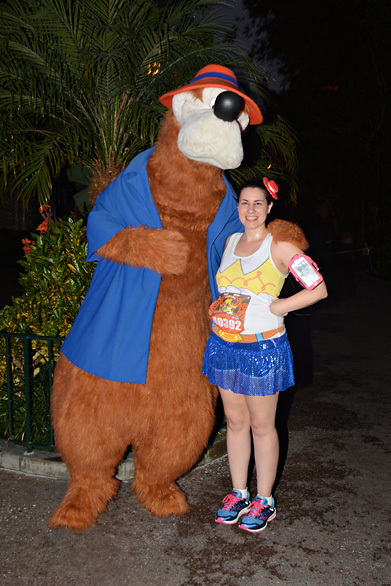 One question…if you have a WDW AP, will that work for pictures for a race in DL? Unfortunately no. You’ll have to purchase photopass at Disneyland to get those pictures. That’s what I was afraid of. I was hoping for a little extra ‘Disney magic (TM).’ Not to be. Thanks for the answer!